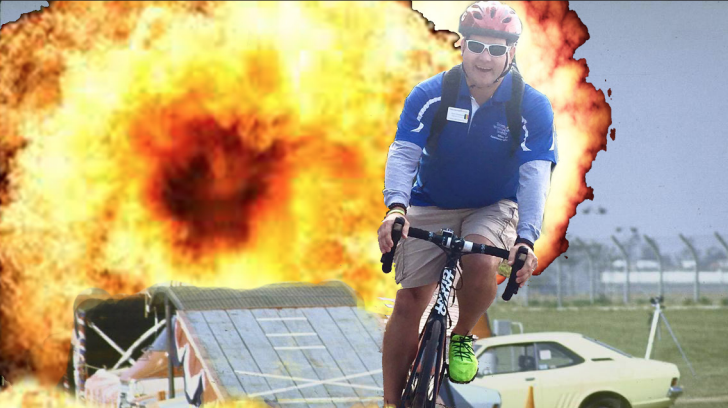 After a successful summer of death defying stunts, jumping his BMX bike over any and all obstacles across New Hampshire’s country fair’s, Matt Peterson’s stunt career was primed to transition from mid-life crisis to a full on second career for the Assistant Director of Residence Life. That was until March 11, when Petersons dislocated and fractured his ankle after slipping during an ice fishing accident on Bow Lake. Petersons went into surgery March 17 needing three screws and a plate inserted into his ankle to help stimulate the healing process. The current timetable for Peterson’s recovery is four months which has cast serious doubt on Petersons’ ability to return to his daredevil antics this summer. Only two weeks after his injury, Petersons has already showed his intention to return to BMX stunt riding once he’s completed his physical therapy. He’s already begun preparation for his first major jump.